Flat Tires Lead to Thankful Hearts. I have to tell you that generally our life is fairly boring. We homeschool, so three days of the week we rarely leave the house. We like it that way. We have our challenges with life like anyone, but for the most part we just make it through the days and life is pretty normal. That is not to say that it has always been that way. I do not consider myself incompetent or boring. I have lived in several places, including short stints in Amsterdam and Hungary, even a summer in a commune in Chicago. I love road trips, ride motorcycles and horses. Shoot guns. Yep. I can handle myself. So, last night when the little bitty light came on in the truck notifying me that the air pressure was off in one of my tires I was not terribly worried. Steve had just left for Munich. I had four kids in the car, which is normal…but I was a little more on guard since, you know…Steve had just left for Munich. So I pulled over. I could literally (yes, appropriate usage) hear the air hissing out of the tire when I opened my door. 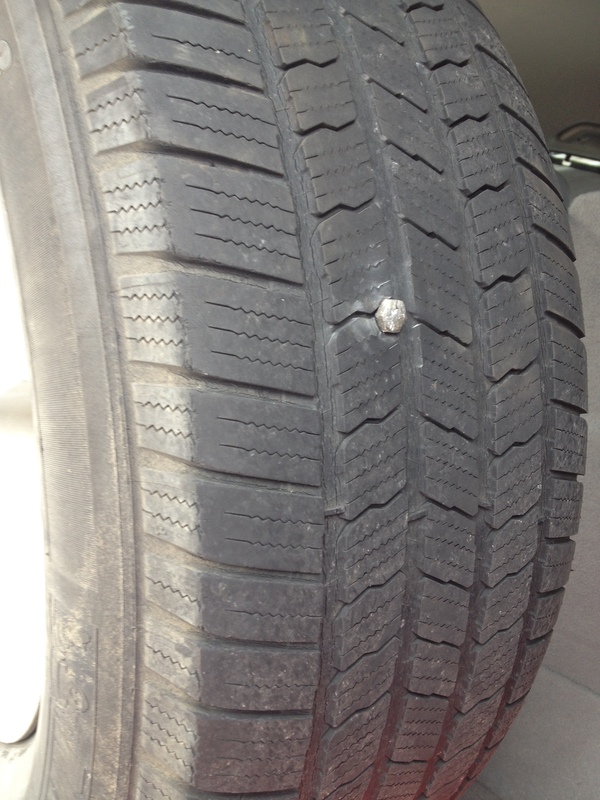 Huge bolt, meet back passenger tire. I have changed a few of tires. This truck though, has a beast of a spare tire to get off. You have to manipulate the pole from the jack through an opening on the bumper, blindly, and find a catch and then you can turn it and lower the the tire from under the truck. Sounds simple. I watched the AAA guy work on it for over an hour one time and just about cry before he got it down. Um, I don’t have AAA anymore because we never used it…dumb me. So, here is where the story is worthy of a blog post. We live in a small town in the south. I am forever grateful for this. We were 10 minutes from home, we were in a parking lot where I knew we would find help. I went in one place but there was no one who could help. I went in the next place and a very kind man said he would come change the tire. 45 minutes later he still didn’t have the spare lowered. I told you…I hate this spare. However, he tried and kept trying. Oh, and it was 20 degrees outside. Then I thought of a man who owns a coffee shop in town who has a similar truck and I wondered if he had ever changed the tire. I called. He not only took my call, he came from the grocery on his way to the shop. Took him 30 minutes to lower the tire. The flat was stuck to the truck. We kicked it. We stared at it. We hit it with a mallet. He went to a tire shop and asked. He went and got wood to lower the truck onto. We told the kids to pray. They prayed, and rummaged through the groceries in the truck. And they never whined…which made me want to kiss them all. We lowered the truck truck and I rocked it back and forth on the wood and finally…finally, after 2 hours…the tire came loose. After that it was the simple changing of a tire. We were home within twenty minutes. All of this happened twenty minutes after Steve’s plane took off toward Munich. That makes me want to laugh. I haven’t had a flat tire in ages…other than one in our driveway. It could have happened on the interestate, it could have happened a multitude of other ways. Instead it happened in our little small town where two very kind men took two hours out of their evening to help. I know they probably took it as a challenge at some point, but they didn’t have to do it, and it makes me terribly thankful. I had a list of other friends I could have made my way through, but something made me call this acquaintance..and I’m thankful I did. Worthy of a blog post? Yeah. Just a thank-you. A moment to say that although there are so many moments that frustrate us…so many moments in the blogosphere where we say the things that are wrong…there are so many things that are right. There are moments where we see the character come out and we are thankful. My kids saw that people are kind. My kids also saw that we figure stuff out. Sometimes it is worth simply saying that. Oh, and for my local friends…it was Jeff from Authentic…so if you need coffee, go by and tell him he’s a great guy. In the darkness….rely on God. Facebook greeted me this morning. I usually take a few minutes and speedily scan updates as I sip my coffee. I rejoiced at birthdays and people getting over colds. Liked pictures of friend’s kids doing, well, kid things. And I paused. I thought of one very dear to me who is now walking through the darkness of divorce. Suddenly. Starting all over. Packing things up and moving. I thought of another who has struggled to find work and deals with burdens that are nearly overwhelming. I thought of another who is in the midst of a confusing and heartbreaking situation, where there are glimpses of hope and yet much darkness. I thought of many who walk in darkness…not evil, not lives encompassed in sin…but darkness that hides the light of hope and of direction. They are faithful to keep walking, to keep pressing in and squinting and looking for that glimmer of light. This verse struck me…that in those moments, when we are stumbling and cannot find the light, that is when we most need to trust. We simply have no other choice. As Ann says on her Facebook page, we want clarity, but God wants us to press in more closely to him in those moments. Don’t look for another light…wait. Trust that he is going to guide you through. Trust, and rely on God. Friends, who we have cheered our sons together as they played hockey. Friends who we know the sound of their voices and the way their eyes look when they laugh, and how the boy’s shoulders shrug when they laugh…those friends…their son was diagnosed with leukemia. Last night. Yes. Still. Trust in the name of the Lord and rely on God. This is the messiness of our broken lives. The heartbreakingly real reality. I will tell the boys during our morning devotionals. That moment when we go around the room and ask what we are going to focus on this week for prayer. Each boy picks a person they want to be focused on during that week. The choice will be simple today. This will be the closest they have come to cancer…these friends are sports friends. They are close enough that the boys will feel the punch in the gut. We do not turn away in these moments, though. We listen. We pay attention. We reach out and we offer any help we can…and we pray. We realize that life is so much deeper and wider, and more fragile, than we think. We realize in these moments that there is holiness in our midst, and we realize our deep, deep need in our brokenness. We are awakened from our laziness of being entertained by the world to realize how fragile and broken, and yet amazing and wonder-filled this world is. These moments stop us. For this family everything has changed. The darkness is thick at times. In those moments, short or long as they may be…trust in the name of the Lord and rely on him. We pray. We trust in the name of the Lord and rely on him.